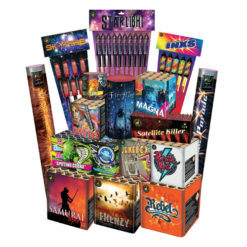 This impressive pack contains a range of great effect barrages for those who want to steer clear of rockets, wheel and candles. Suitable for schools, pubs and large garden parties. This Juke Box doesn’t need a coin in the slot to get going! 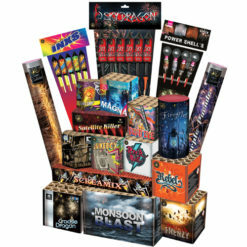 Just light this stunning category 2 16 shot garden firework with a great duration of 30 seconds. Filling the air with colourful red, green and blue tails rising to vivid red stars with crackle and green bouquets. Rising from ground level this good-looking 19 shot low noise cake, with titanium crackling comet tails is a marvellous addition to any display. This Rebel is a knockout with a fantastic mine effect in a variety of colours including red, blue, green white and crackle. With overhead massive bouquets in matching red, blue, green, white and crackling stars leading to a multi-shot finale. Watch as the Crackle Dragon breathes into life. 14 big bore shots starting with gold and white cluster mines. Then changing to wide golden crackling comet tails. Ending with a finale salvo of noisy crackling dragon eggs, over a duration of 25 seconds. Blink at it’s very best. The 1.3g effect Imperial Blink barrage gives your twenty-one huge firework bursts in 30 seconds. Starting with silver glitter tails to silver blink. Green tails to bright green blink. Red glitter tails to red blink strobe. Before finishing with a volley of golden tails and brilliant gold blinking strobe. This cobra strikes from the start with 24 stunning loud shots lasting 40 seconds, filling the sky with a variety of effects & colours including purple peony with white tails, blue peony with gold strobe and purple and gold strobe. Great addition to your display. Blue, green & red tails rising to red stars, with more crackle then your scratched vinyl. Enjoy this splendid 16 shot cake lasting 30 seconds, with a multi shot finale. No need to go to the Devil’s Tower for this Close Encounter. Red and green tails rise into outer space transforming into crackling & whistling UFO’s. An out of this world 25 shot low noise barrage lasting approximately 45 seconds. Don’t be surprised with what flies out of the box. Stunning thick crackling dragon tails that shatter in the air at over 90 feet into vast bouquets of red and crackling stars. Followed by green and crackling stars to blue with crackling stars. An excellent 25 shots category 2 firework ending with a mini-crescendo. Awesome brocade mines to huge thunderous brocade crown bouquets are all part of this Magnum Series big bore 1.3G effect barrage. Duration of approximately 30 seconds. Feel the force of the Samurai Spirit. 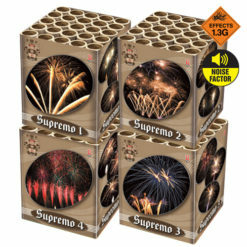 This beautiful 25 shot category 2 garden firework fires forceful bursts. Dazzling with silver blink mines and intense bursts of bright red, vibrant blue and brilliant silver blink. Before strong breaks of purple, green and silver blink bouquets fill the sky. Wave Willow “produces lovely big effects and loud too”. This breathtaking 19 shot barrage fills the sky with stunning 1.3g effects. With lovely thick silver blinking tails rising into the night sky. Leading to massive breaks of double willow breaks with blue, red and green pearls. 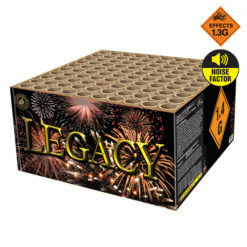 This firework will feel like your at a professional display. “Shot down in a Blaze of Glory” ♫♪♬. This dramatic large calibre barrage is sky filling. With skyward blazing tails including gold glitter with red pearl. Gold glitter with a green pearl. Blue Star and a crackling comet tail. All heading into the night before bursting. With huge gold willow breaks to coloured tips in red, blue and green. For the Wrath of the Gods is revealed from the heavens. This 50 shots diverse barrages have a variety of interchanging effects. With a mix of crackling tails with red peony, green and purple wave to crackle bouquet. Then colourful star mines to multicolour wave with colour stars. Followed by red and greens tars to spinner silver tourbillions. With a climax of whistling comet tails to crackling silver bouquet. This 20mm compound firework is at the peak of its performance. The Pinnacle 100 shot combination barrage reaches over 90 feet in the air. With massive shots of red strobes, green and silver blink mines. Leading up to vibrant breaks of sea blue with a silver blink. With lemon pearls to deep red blink. Elegant golden palms with bright blue stars. Finally flourishing with titanium silver chrysanthemums. 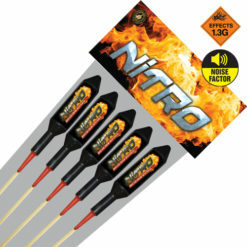 Professional use taper designed for lighting fireworks safely. Each one has a four minute burn time producing an intense 1 inch burning flame. This safety kits contains one pair of safety goggles rated to BS EN166-B and British Kite marked along with one pair of disposable ear plugs to CE0086 rating. You only have one pair of eyes and ear protect them. Style and colour may vary. What a great assortment of fireworks. I got this package and a few extra ones and my friends and family were blown away also half the neighbourhood too. We had people shouting praise and clapping in street will definitely be buying more in the future thanks Dynamic Fireworks!! All the firework were fantastic, it really help with Dynamic providing a firing order, crowd loved it. Will be back again for sure. 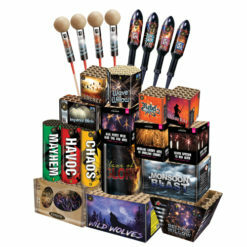 Just looking for simple selection light and go fireworks, then the discounted Barrage Pack is the right choice. With no fiddly firework rockets, roman candles or Catherine wheels. 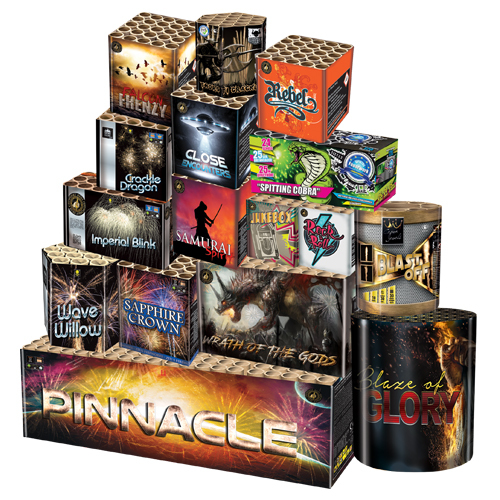 This impressive pack contains a range of great effect cakes and barrages. 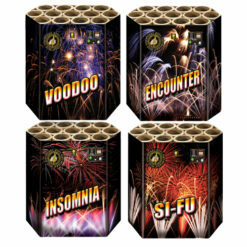 Offering a variety of category 2 fireworks requiring a safety distance of up to 25 metres, with an excellent array of effects reaching up to and over 100ft in the air. Hence, for additional safety information check out our helpful safety guide with step by step advice.